Please note that the following list is not exhaustive and does not include every notable storm in history. This killer weather system was first detected over the tropical Atlantic on August 27. While the history of the track and intensity is not fully known, the system reached Cuba as a tropical storm on September 3 and moved into the southeastern Gulf of Mexico on the 5th. A general west-northwestward motion occurred over the Gulf accompanied by rapid intensification. By the time the storm reached the Texas coast south of Galveston late on September 8, it was a Category 4 hurricane. After landfall, the cyclone turned northward through the Great Plains. It became extratropical and turned east-northeastward on September 11, passing across the Great Lakes, New England, and southeastern Canada. It was last spotted over the north Atlantic on September 15. For an interactive map of the Galveston Hurricane visit the NOAA Coastal Services Center. This fearsome cyclone was first detected near the Lesser Antilles on September 2. It moved generally west-northwestward for several days, passing near the Dominican Republic on September 4 and into the southeastern Bahamas on the 5th and 6th. At that time it became a hurricane. A westward turn on September 7 took the center across the central Bahamas on the 7th and 8th and into the Straits of Florida on the 9th. The now large hurricane was of Category 4 intensity as the eye passed just south of Key West, Florida and the Dry Tortugas on September 10. A continued west to west-northwestward motion brought the center to the Texas coast south of Corpus Christi as a Category 3 hurricane on September 14. The cyclone dissipated over northern Mexico and southern Texas the next day. Although hurricane-force winds occurred over the Florida Keys and the central and south Texas coast, no reliable wind measurements are available from near the center. A storm surge of up to 12 ft inundated Corpus Christi, Texas causing major damage to the coastal areas. A ship moored near the Dry Tortugas measured a pressure of 27.37 inches as the center passed, and based on this, the storm is ranked as the third most intense to hit the United States. The death toll was estimated at 600 to 900 people. Of these, more than 500 were lost on ten ships that either sunk or were reported missing. Damage in the United States was estimated at $22 million. For an interactive map of the Atlantic-Gulf Hurricane visit the NOAA Coastal Services Center. The "Great Miami" Hurricane was first spotted as a tropical wave located 1,000 miles east of the Lesser Antilles on September 11th. The system moved quickly westward and intensified to hurricane strength as it moved to the north of Puerto Rico on the 15th. Winds were reported to be nearly 150 mph as the hurricane passed over the Turks Islands on the 16th and through the Bahamas on the 17th. Little in the way of meteorological information on the approaching hurricane was available to the Weather Bureau in Miami. As a result, hurricane warnings were not issued until midnight on September 18th, which gave the booming population of South Florida little notice of the impending disaster. The Category 4 hurricane's eye moved directly over Miami Beach and downtown Miami during the morning hours of the 18th. 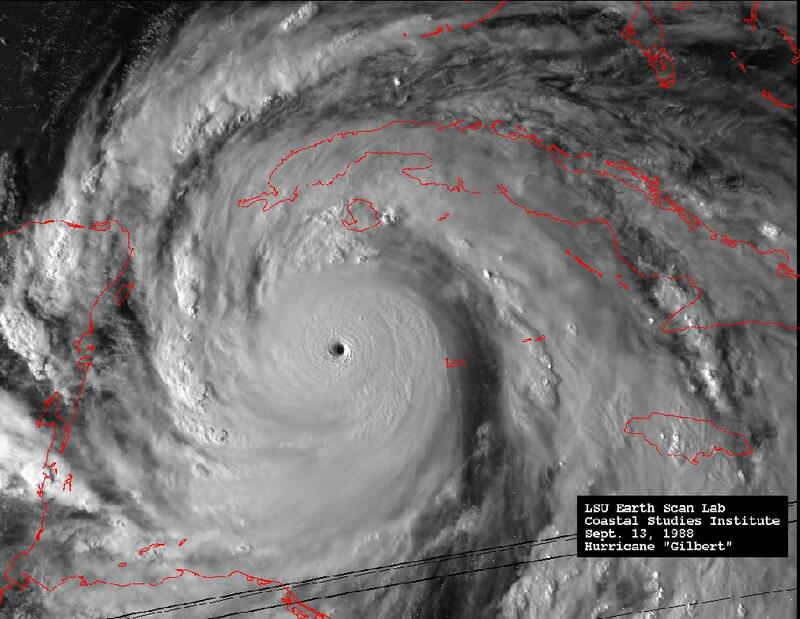 This cyclone produced the highest sustained winds ever recorded in the United States at the time, and the barometric pressure fell to 27.61 inches as the eye passed over Miami. A storm surge of nearly 15 feet was reported in Coconut Grove. Many casualties resulted as people ventured outdoors during the half-hour lull in the storm as the eye passed overhead. Most residents, having not experienced a hurricane, believed that the storm had passed during the lull. They were suddenly trapped and exposed to the eastern half of the hurricane shortly thereafter. Every building in the downtown district of Miami was damaged or destroyed. The town of Moore Haven on the south side of Lake Okeechobee was completely flooded by lake surge from the hurricane. Hundreds of people in Moore Haven alone were killed by this surge, which left behind floodwaters in the town for weeks afterward. The hurricane continued northwestward across the Gulf of Mexico and approached Pensacola on September 20th. The storm nearly stalled to the south of Pensacola later that day and buffeted the central Gulf Coast with 24 hours of heavy rainfall, hurricane force winds, and storm surge. The hurricane weakened as it moved inland over Louisiana later on the 21st. Nearly every pier, warehouse, and vessel on Pensacola Bay was destroyed. The great hurricane of 1926 ended the economic boom in South Florida and would be a $90 billion disaster had it occurred in recent times. With a highly transient population across southeastern Florida during the 1920s, the death toll is uncertain since more than 800 people were missing in the aftermath of the cyclone. A Red Cross report lists 373 deaths and 6,381 injuries as a result of the hurricane. For an interactive map of the Great Miami Hurricane visit the NOAA Coastal Services Center. This classic Cape Verde hurricane was first detected over the tropical Atlantic on September 10, although it likely formed several days earlier. It moved westward through the Leeward Islands on the 12th. It then turned west-northwestward, scoring a direct hit on Puerto Rico on the 13th (the feast of San Felipe) as a Category 4 hurricane. The hurricane continued west-northwestward through the Bahamas and made landfall near Palm Beach, Florida on September 16. It turned north-northeastward over the Florida Peninsula on the 17th, a motion which brought the remains of the storm to eastern North Carolina on the 19th. It then turned northward and merged with a non-tropical low over the eastern Great Lakes on September 20. No reliable wind readings are available from near the landfall area in Florida. However, Palm Beach reported a minimum pressure of 27.43 in, making this the fourth strongest hurricane of record to hit the United States. In Puerto Rico, San Juan reported 144 mph sustained winds, while Guayama reported a pressure of 27.65 inches. Additionally, a ship just south of St. Croix, United States Virgin Islands (USVI) reported a pressure of 27.50 inches, while Guadeloupe in the Leeward Islands reported a pressure of 27.76 inches. This hurricane caused heavy casualties and extensive destruction along its path from the Leeward Islands to Florida. The worst tragedy occurred at inland Lake Okeechobee in Florida, where the hurricane caused a lake surge of 6 to 9 ft that inundated the surrounding area. 1,836 people died in Florida, mainly due to the lake surge. An additional 312 people died in Puerto Rico, and 18 more were reported dead in the Bahamas. Damage to property was estimated at $50,000,000 in Puerto Rico and $25,000,000 in Florida. For an interactive map of the San Felipe-Okeechobee Hurricane visit the NOAA Coastal Services Center. This system was first detected east of the central Bahamas on August 29. Moving westward, it passed near Andros Island on September 1, at which time it reached hurricane strength and turned west-northwestward. Phenomenal strengthening then occurred, and when the storm reached the middle Florida Keys on September 2, it was a Category 5 hurricane. After roaring through the Keys, the hurricane turned gradually northward almost parallel to the Florida west coast until it again made landfall near Cedar Key as a Category 2 hurricane on the 4th. A northeastward motion took the storm across the southeastern United States to the Atlantic coast near Norfolk, Virgina on September 6. It continued into the Atlantic, becoming extratropical on the 7th and last being detected on the 10th. No wind measurements are available from the core of this small, but vicious hurricane. A pressure of 26.35 inches measured at Long Key, Florida makes this the most intense hurricane of record to hit the United States and the third most intense hurricane of record in the Atlantic basin (surpassed only by the 26.05 inches in Hurricane Wilma in 2005 and 26.22 inches observed in Hurricane Gilbert in 1988). The combination of winds and tides were responsible for 408 deaths in the Florida Keys, primarily among World War I veterans working in the area. Damage in the United States was estimated at $6 million. For an interactive map of the Labor Day Hurricane visit the NOAA Coastal Services Center. The "Long Island Express" was first detected over the tropical Atlantic on September 13, although it may have formed a few days earlier. Moving generally west-northwestward, it passed to the north of Puerto Rico on the 18th and 19th, likely as a category 5 hurricane. It turned northward on September 20 and by the morning of the 21st it was 100 to 150 miles east of Cape Hatteras, North Carolina. At that point, the hurricane accelerated to a forward motion of 60 to 70 mph, making landfall over Long Island and Connecticut that afternoon as a Category 3 hurricane. The storm became extratropical after landfall and dissipated over southeastern Canada on September 22. Blue Hill Observatory, Massachusetts measured sustained winds of 121 mph with gusts to 183 mph (likely influenced by terrain). A U.S. Coast Guard station on Long Island measured a minimum pressure of 27.94 in. Storm surges of 10 to 12 ft inundated portions of the coast from Long Island and Connecticut eastward to southeastern Massachusetts, with the most notable surges in Narragansett Bay and Buzzards Bay. Heavy rains before and during the hurricane produced river flooding, most notably along the Connecticut River. This hurricane struck with little warning and was responsible for 600 deaths and $308 million in damage in the United States. For an interactive map of the New England Hurricane visit the NOAA Coastal Services Center. This large and powerful hurricane was first detected northeast of the Leeward Islands on September 9. It moved west-northwestward through the 12th, then turned northward on a track that brought the center near Cape Hatteras, North Carolina on the 14th. The cyclone accelerated north-northeastward, moving across eastern New England and into Canada by September 15. The storm became extratropical over Canada and finally merged with a larger low near Greenland on September 16. This hurricane was of Category 3 intensity at landfalls at Cape Hatteras, Long Island, and Point Judith, Rhode Island, and Category 2 as far north as the coast of Maine. Cape Henry, VA reported 134 mph sustained winds (measured 90 ft above the ground) with estimated gusts to 150 mph. Widespread hurricane-force winds were reported elsewhere along the storm track from North Carolina to Massachusetts with a maximum reported gust of 109 mph at Hartford, Connecticut. Rainfall totals of 6 to 11 inches accompanied the storm. While this hurricane caused 46 deaths and $100 million in damage in the United States, the worst effects occurred at sea where it wreaked havoc on World War II shipping. Five ships, including a U. S. Navy destroyer and minesweeper, two U. S. Coast Guard cutters, and a light vessel, sank due to the storm causing 344 deaths. For an interactive map of the Great Atlantic Hurricane visit the NOAA Coastal Services Center. Carol formed near the central Bahama Islands on August 25, and moved slowly northward and north-northwestward. By August 30 it was a hurricane about 100-150 miles east of Charleston, South Carolina. It then accelerated north-northeastward, make landfall as a Category 3 hurricane over Long Island, New York and Connecticut on the 31st. The cyclone became extratropical later that day as it crossed the remainder of New England and southeastern Canada. Sustained winds of 80 to 100 mph were reported over much of eastern Connecticut, all of Rhode Island, and eastern Massachusetts. A peak gust of 130 mph was reported at Block Island, Rhode Island, while gusts of 100 to 125 mph occurred over much of the rest of the affected area. Storm surge flooding occurred along the New England coast from Long Island northward, with water depths of 8 to 10 ft reported in downtown Providence, Rhode Island. Carol was responsible for 60 deaths and $461 million in damage in the United States. No discussion of Carol is complete without mention of the remarkably similar Hurricane Edna. This storm first formed east of the Windward Islands on September 2. It moved northwestward, and by September 7 it was a hurricane very near where Carol had formed two weeks before. From this point, Edna followed a path just east of Carol's. It accelerated past Cape Hatteras, North Carolina on September 10 and made landfall over Cape Cod as a Category 3 hurricane the next day. Edna moved across Maine into eastern Canada later on the 11th as it became extratropical. Martha's Vinyard, Massachusetts reported a peak wind gust of 120 mph during Edna, and much of the rest of the affected area had gusts of 80 to 100 mph. The storm was responsible for 20 deaths and $40 million in damage in the United States. For an interactive map of Hurricanes Carol and Edna visit the NOAA Coastal Services Center. Hazel was first spotted east of the Windward Islands on October 5. It moved through the islands later that day as a hurricane, then it moved westward over the southern Caribbean Sea through October 8. A slow turn to the north-northeast occurred from October 9-12, with Hazel crossing western Haiti as a hurricane on the 12th. The hurricane turned northward and crossed the southeastern Bahamas on the 13th, followed by a northwestward turn on the 14th. Hazel turned north and accelerated on October 15, making landfall as a Category 4 hurricane near the North Carolina-South Carolina border. Subsequent rapid motion over the next 12 hours took the storm from the coast across the eastern United States into southeastern Canada as it became extratropical. High winds occurred over large portions of the eastern United States. Myrtle Beach, South Carolina reported a peak wind gust of 106 mph, and winds were estimated at 130 to 150 mph along the coast between Myrtle Beach and Cape Fear, North Carolina. Washington, DC reported 78 mph sustained winds, and peak gusts of over 90 mph occurred as far northward as inland New York state. A storm surge of up to 18 ft inundated portions of the North Carolina coast. Heavy rains of up to 11 inches occurred as far northward as Toronto, Canada resulting in severe flooding. Hazel was responsible for 95 deaths and $281 million in damage in the United States, 100 deaths and $100 million in damage in Canada, and an estimated 400 to 1000 deaths in Haiti. For an interactive map of Hurricane Hazel visit the NOAA Coastal Services Center. These two hurricanes must be mentioned together. They struck the North Carolina coast only five days apart, and the rains from Connie set the stage for the devastating floods caused by Diane. Connie was first detected as a tropical storm over the tropical Atlantic on August 3. It moved just north of west for several days, reaching hurricane strength several hundred miles northeast of the Leeward Islands on the 5th. After passing north of the Leewards on the 6th, Connie turned northwestward - a motion that continued until the 10th. An erratic, generally north-northwestward motion then brought Connie to the North Carolina coast on August 12 as a Category 3 hurricane. This was followed by a gradual northwestward turn through August 14, when Connie dissipated over the eastern Great Lakes. Fort Macon, North Carolina reported 75 mph sustained winds with gusts to 100 mph, while a storm surge of up to 8 ft occurred along the coast. There were no reported deaths and the damage in the United States was $40 million. However, the most significant aspect of Connie was the rainfall of up to 12 inches that affected the northeastern United States. Diane was first detected over the tropical Atlantic on August 7. Moving generally west-northwestward, the cyclone became a tropical storm on the 9th. Diane became a hurricane on August 11, by which time it was moving northwestward. A northward turn occurred on the 12th, followed by a westward turn on the 13th and a west-northwestward motion on the 14th. This motion brought Diane to the North Carolina coast on August 17 as a Category 1 hurricane. The storm turned northward across Virginia, then it turned northeastward and moved back into the Atlantic near Long Island, New York on August 19. Diane became extratropical over the North Atlantic on the 21st. Hurricane conditions affected only a small part of the North Carolina coast, and the damage from winds and tides was relatively minor. The main impact was heavy rains. Diane poured 10 to 20 inches of rain on areas soaked by Connie just a few days before, producing widespread severe flooding from North Carolina to Massachusetts. The floods were responsible were 184 deaths and $832 million in damage. For an interactive map of Hurricanes Connie and Diane visit the NOAA Coastal Services Center. Audrey was first detected over the southwestern Gulf of Mexico on June 24. It moved slowly northward as it became a tropical storm and a hurricane the next day. A faster northward motion brought the center to the coast near the Texas-Louisiana border on the 27th. Rapid strengthening in the last six hours before landfall meant Audrey made landfall as a Category 4 hurricane. The cyclone turned northeastward after landfall, becoming extratropical over northern Mississippi on June 28 and merging with another low over the Great Lakes the next day. The combined system was responsible for strong winds and heavy rains over portions of the eastern United States and Canada. No reliable wind or pressure measurements are available from Audrey's core at landfall. The main impact was from 8 to 12 ft storm surges that penetrated as far inland as 25 miles over portions of low-lying southwestern Louisiana. These surges were responsible for the vast majority of the 390 deaths from Audrey. Damage in the United States was estimated at $150 million. For an interactive map of Hurricane Audrey visit the NOAA Coastal Services Center. One of the all-time great hurricanes, Donna was first detected as a tropical wave moving off the African coast on August 29. It became a tropical storm over the tropical Atlantic the next day and a hurricane on September 1. Donna followed a general west-northwestward track for the following five days, passing over the northern Leeward Islands on the 4th and 5th as a Category 4 hurricane and then to the north of Puerto Rico later on the 5th. Donna turned westward on September 7 and passed through the southeastern Bahamas. A northwestward turn on the 9th brought the hurricane to the middle Florida Keys the next day at Category 4 intensity. Donna then curved northeastward, crossing the Florida Peninsula on September 11, followed by eastern North Carolina (Category 3) on the 12th, and the New England states (Category 3 on Long Island and Categories 1 to 2 elsewhere) on the 12th and 13th. The storm became extratropical over eastern Canada on the 13th. Donna is the only hurricane of record to produce hurricane-force winds in Florida, the Mid-Atlantic states, and New England. Sombrero Key, Florida reported 128 mph sustained winds with gusts to 150 mph. In the Mid-Atlantic states, Elizabeth City, North Carolina reported 83 mph sustained winds, while Manteo, North Carolina reported a 120 mph gust. In New England, Block Island, Rhode Island reported 95 mph sustained winds with gusts to 130 mph. Donna caused storm surges of up to 13 ft in the Florida Keys and 11 ft surges along the southwest coast of Florida. Four to eight ft surges were reported along portions of the North Carolina coast, with 5 to 10 ft surges along portions of the New England coast. Heavy rainfalls of 10 to 15 inches occurred in Puerto Rico, 6 to 12 inches in Florida, and 4 to 8 inches elsewhere along the path of the hurricane. The landfall pressure of 27.46 inches makes Donna the fifth strongest hurricane of record to hit the United States. It was responsible for 50 deaths in the United States. One hundred and fourteen deaths were reported from the Leeward Islands to the Bahamas, including 107 in Puerto Rico caused by flooding from the heavy rains. The hurricane caused $387 million in damage in the United States and $13 million elsewhere along its path. The National Hurricane Center also maintains the official Tropical Cyclone Report for Hurricane Donna. For an interactive map of Hurricane Donna visit the NOAA Coastal Services Center. This powerful, deadly, and destructive hurricane formed just west of the Cayman Islands on August 14. It rapidly intensified and by the time it reached western Cuba the next day it was a Category 3 hurricane. 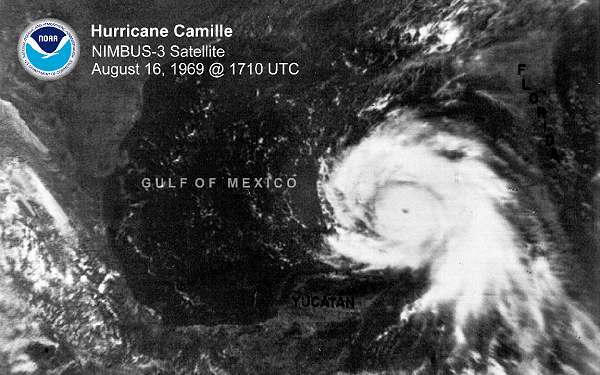 Camille tracked north-northwestward across the Gulf of Mexico and became a Category 5 hurricane on August 16. The hurricane maintained this intensity until it made landfall along the Mississippi coast late on the 17th. Camille weakened to a tropical depression as it crossed Mississippi into western Tennessee and Kentucky, then it turned eastward across West Virginia and Virginia. The cyclone moved into the Atlantic on August 20 and regained tropical storm strength before becoming extratropical on the 22nd. A minimum pressure of 26.84 inches was reported in Bay St. Louis, Mississippi, which makes Camille the second most intense hurricane of record to hit the United States. The actual maximum sustained winds will never be known, as the hurricane destroyed all the wind-recording instruments in the landfall area. The estimates at the coast are near 200 mph. Columbia, Mississippi, located 75 miles inland, reported 120 mph sustained winds. A storm tide of 24.6 ft occurred at Pass Christian, Mississippi. The heaviest rains along the Gulf Coast were about 10 inches. However, as Camille passed over the Virginias, it produced a burst of 12 to 20 inch rains with local totals of up to 31 inches. Most of this rain occurred in 3 to 5 hours and caused catastrophic flash flooding. The combination of winds, surges, and rainfalls caused 256 deaths (143 on the Gulf Coast and 113 in the Virginia floods) and $1.421 billion in damage. Three deaths were reported in Cuba. The National Hurricane Center also maintains the official Tropical Cyclone Report for Hurricane Camille. For an interactive map of Hurricane Camille visit the NOAA Coastal Services Center. The large disturbance that became Agnes was first detected over the Yucatan Peninsula of Mexico on June 14. The system drifted eastward and became a tropical depression later that day and a tropical storm over the northwestern Caribbean on the 16th. Agnes turned northward on June 17 and became a hurricane over the southeastern Gulf of Mexico the next day. A continued northward motion brought Agnes to the Florida Panhandle coast on June 19 as a Category 1 hurricane. Agnes turned northeastward after landfall and weakened to a depression over Georgia. However, it regained tropical storm strength over eastern North Carolina on June 21 and moved into the Atlantic later that day. A northwestward turn followed, and a just-under-hurricane-strength Agnes made a final landfall on the 22nd near New York, New York. The storm merged with a non-tropical low on June 23rd, with the combined system affecting the northeastern United States until the 25th. Agnes was barely a hurricane at landfall in Florida, and the effects of winds and storm surges were relatively minor. The major impact was over the northeastern United States, where Agnes combined with the non-tropical low to produce widespread rains of 6 to 12 inches with local amounts of 14 to 19 inches. These rains produced widespread severe flooding from Virginia northward to New York, with other flooding occurring over the western portions of the Carolinas. Agnes caused 122 deaths in the United States. Nine of these were in Florida (mainly from severe thunderstorms) while the remainder were associated with the flooding. The storm was responsible for $2.1 billion in damage in the United States, the vast majority of which came from the flooding. Agnes also affected western Cuba, where seven additional deaths occurred. The National Hurricane Center also maintains the official Tropical Cyclone Report for Hurricane Agnes. 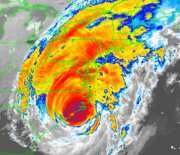 For an interactive map of Hurricane Agnes visit the NOAA Coastal Services Center. Claudette was first detected as a tropical wave that moved off the African coast on July 11. The wave spawned a tropical depression on July 16 that briefly became a tropical storm the next day as it approached the Leeward and Virgin Islands. Claudette weakened to a tropical depression and then a tropical wave while passing near Puerto Rico on the 18th, and little re-development occurred until the system moved into the southeastern Gulf of Mexico on the 21st. Claudette regained tropical storm strength over the western Gulf on July 23 and made landfall the next day near the Louisiana-Texas border. It made a slow loop over southeastern Texas on the 24th and 25th, followed by a northward motion into Oklahoma on the 27th. The remnants of Claudette turned eastward and merged with a frontal system over West Virginia on July 29. Claudette produced tropical storm conditions along portions of the Texas and Louisiana coasts, but the storm will be most remembered for its rainfall. Widespread amounts in excess of 10 inches occurred over portions of southeastern Texas and southwestern Louisiana, with several local amounts in excess of 30 inches. An observer west of Alvin, Texas reported 43 inches in 24 hours, which is a United States record for 24 hour rainfall amount. The storm total at that location was 45 inches. The rains produced severe flooding that was responsible for one death and $400 million in damage. The storm also produced heavy rains over portions of Puerto Rico that were responsible for one death. The National Hurricane Center also maintains the official Tropical Cyclone Report for Tropical Storm Claudette. For an interactive map of Tropical Storm Claudette visit the NOAA Coastal Services Center. Alicia formed over the north central Gulf of Mexico on August 15. It drifted slowly westward and northwestward while steadily strengthening on the 16th and 17th. 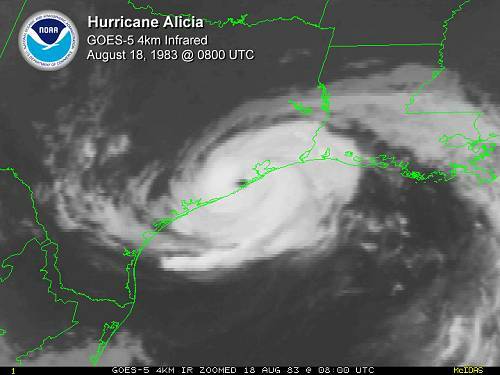 This motion brought Alicia over the western end of Galveston Island, Texas as a Category 3 hurricane on August 18. Alicia moved northwestward into Oklahoma as a tropical depression on August 19, then turned northward before dissipating over Nebraska on the 21st. The Coast Guard cutter Buttonwood moored at Galveston reported sustained winds of 96 mph with gusts to 125 mph. Hobby Airport at Houston, Texas reported 94 mph sustained winds with gusts to 107 mph. Wind gusts of hurricane force in downtown Houston littered the streets with broken glass as windows broke in the high-rise buildings. Additionally, twenty-three tornadoes were reported from Alicia. The National Hurricane Center also maintains the official Tropical Cyclone Report for Hurricane Alicia. For an interactive map of Hurricane Alicia visit the NOAA Coastal Services Center. Alicia was responsible for 21 deaths and $2 billion in damage in the United States. A tropical wave exiting the African coastline on September 3rd developed into the 12th tropical depression of the season on September 8th while approaching the Windward Islands. The cyclone rapidly strengthened to hurricane status on September 10th as a west-northwest motion brought Gilbert into the eastern Caribbean Sea. Gilbert passed directly over Jamaica on September 12th as a major hurricane, becoming the first direct impact for the island from a hurricane since 1951. Winds gusted to nearly 150 mph as Gilbert produced a 9-foot storm surge along Jamaica’s northeast coast. Jamaica was devastated as the eyewall traversed the entire length of the island. During this period the eye contracted from 25 nmi to only 12 nmi upon exiting Jamaica. Gilbert emerged off the western coastline of Jamaica and began a period of extraordinarily rapid intensification. The ferocious hurricane strengthened to Category 4 status as its northern eyewall pounded Grand Cayman Island with 155 mph wind gusts early on September 13th. Gilbert’s remarkable intensification trend continued as the cyclone reached Category 5 status on the afternoon of the 13th and eventually reached peak winds of 185 mph. The minimum central pressure of the cyclone plummeted to 888 millibars, which represented a 70-millibar drop in only a 24-hour period. This minimum central pressure recorded by NOAA aircraft was the lowest pressure ever recorded in the western hemisphere until Hurricane Wilma in 2005. Gilbert crossed the northeast coast of Mexico’s Yucatan peninsula on September 14th, becoming the first Category 5 hurricane in the Atlantic basin to strike land since Camille in 1969. Gilbert weakened over the Yucatan peninsula and emerged into the western Gulf of Mexico as a Category 2 hurricane. Gilbert’s large circulation regained major hurricane status as the cyclone continued on a west-northwest course on the 16th. The hurricane made its final landfall near the town of La Pesca on the Mexican Gulf Coast on the evening of September 16th as a strong Category 3 hurricane. Gilbert’s remnants spawned 29 tornadoes over Texas on September 18th, with flooding spreading to the Midwest as the remnants merged with a frontal boundary over Missouri on September 19th. Although no reliable measurements of storm surge exist from Gilbert’s two Mexican landfalls, estimates are that Gilbert produced between 15 and 20 feet of surge along the Yucatan and 8 to 13 feet at landfall in mainland Mexico. Gilbert’s large size and impacts were felt over much of the Caribbean, Central America as well as portions of the United States. The death toll of 318 gives an idea of the scope of Gilbert's impacts: Mexico 202, Jamaica 45, Haiti 30, Guatemala 12, Honduras 12, Dominican Republic 5, Venezuela 5, United States 3, Costa Rica 2, and Nicaragua 2. The deaths from Costa Rica, Guatemala, Honduras, Nicaragua, and Venezuela were caused by inland flash flooding from outer rainbands. The National Hurricane Center also maintains the official Tropical Cyclone Report for Hurricane Gilbert. For an interactive map of Hurricane Gilbert visit the NOAA Coastal Services Center. This classic Cape Verde hurricane was first detected as a tropical wave emerging from the coast of Africa on September 9. Moving steadily westward, the system became a tropical depression the next day, a tropical storm on the 11th, and a hurricane on the 13th. 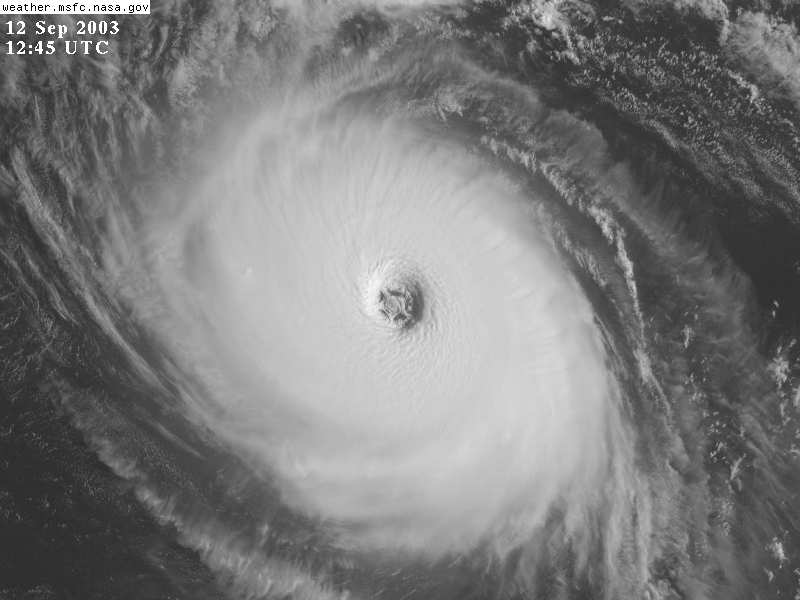 Hugo turned west-northwest on September 15 as it became a Category 5 hurricane. It was still a Category 4 hurricane when the center moved through the Leeward Islands and St. Croix, USVI, and the 18th. Turning northwestward, the center passed across the eastern end of Puerto Rico on September 19. This general motion would continue with some acceleration until Hugo made landfall just north of Charleston, South Carolina on 22 September. Strengthening in the last twelve hours before landfall made Hugo a Category 4 hurricane at the coast. After landfall, the storm gradually recurved northeastward, becoming extratropical over southeastern Canada on September 23. The Naval Air Station at Roosevelt Roads, PR reported sustained winds of 104 mph with gusts to 120 mph, which were the highest winds reported from the Caribbean. A ship moored in the Sampit River in South Carolina measured sustained winds of 120 mph. High winds associated with Hugo extended far inland, with Shaw Air Force Base, South Carolina reporting 67 mph sustained winds with gusts to 110 mph and Charlotte, North Carolina reporting 69 mph sustained winds and gusts to 99 mph. Storm surge from Hugo inundated the South Carolina Coast from Charleston to Myrtle Beach, with maximum storm tides of 20 ft observed in the Cape Romain-Bulls Bay area. Hugo was responsible for 21 deaths in the mainland United States, five more in Puerto Rico and the U. S. Virgin Islands, and 24 more elsewhere in the Caribbean. Damage estimates are $7 billion in the mainland United States and $1 billion in Puerto Rico and the U.S. Virgin Islands. The National Hurricane Center also maintains the official Tropical Cyclone Report for Hurricane Hugo. For an interactive map of Hurricane Hugo visit the NOAA Coastal Services Center. One of the most destructive United States hurricanes of record started modestly as a tropical wave that emerged from the west coast of Africa on August 14. The wave spawned a tropical depression on August 16, which became Tropical Storm Andrew the next day. Further development was slow, as the west-northwestward moving Andrew encountered an unfavorable upper-level trough. Indeed, the storm almost dissipated on August 20 due to vertical wind shear. By August 21, Andrew was midway between Bermuda and Puerto Rico and turning westward into a more favorable environment. Rapid strengthening occurred, with Andrew reaching hurricane strength on the 22nd and Category 4 status on the 23rd. After briefly weakening over the Bahamas, Andrew regained Category 4 status as it blasted its way across south Florida on August 24. The hurricane continued westward into the Gulf of Mexico where it gradually turned northward. This motion brought Andrew to the central Louisiana coast on August 26 as a Category 3 hurricane. Andrew then turned northeastward, eventually merging with a frontal system over the Mid-Atlantic states on August 28. Reports from private barometers helped establish that Andrew's central pressure at landfall in Homestead, Florida was 27.23 inches, which makes it the third most intense hurricane of record to hit the United States. Andrew's peak winds in south Florida were not directly measured due to destruction of the measuring instruments. An automated station at Fowey Rocks reported 142 mph sustained winds with gusts to 169 mph (measured 144 ft above the ground), and higher values may have occurred after the station was damaged and stopped reporting. The National Hurricane Center had a peak gust of 164 mph (measured 130 ft above the ground), while a 177 mph gust was measured at a private home. Additionally, Berwick, LA reported 96 mph sustained winds with gusts to 120 mph. Andrew produced a 17 ft storm surge near the landfall point in Florida, while storm tides of at least 8 ft inundated portions of the Louisiana coast. Andrew also produced a killer tornado in southeastern Louisiana. Andrew is responsible for 23 deaths in the United States and three more in the Bahamas. The hurricane caused $26.5 billion in damage in the United States, of which $1 billion occurred in Louisiana and the rest in south Florida. The vast majority of the damage in Florida was due to the winds. Damage in the Bahamas was estimated at $250 million. The National Hurricane Center also maintains the official Tropical Cyclone Report for Hurricane Andrew. For an interactive map of Hurricane Andrew visit the NOAA Coastal Services Center. More images of Andrew are available from NASA Goddard Laboratory website. Alberto was first detected as a tropical wave that moved off the African coast on 18 June. The wave moved into the western Caribbean by late June and formed into a tropical depression near the western tip of Cuba on June 30. The cyclone moved northwest through July 1 as it became a tropical storm, then it turned northward. This motion continued until the cyclone made landfall in the western Florida Panhandle on the 4th. Alberto then moved north-northeastward into western Georgia, where it did a loop on the 5th and 6th. The cyclone finally dissipated over central Alabama on July 7. Alberto's winds and tides produced only minor damage at the coast, but the excessive rains that fell in Georgia, Alabama, and western Florida were another story. Amounts exceeded 10 inches in many locations, with the maximum being the 27.61 inch storm total at Americus, GA (including 21 inches in 24 hours). Severe flooding resulted over large portions of southern Georgia, western Alabama, and the western Florida Panhandle. The floods were responsible for 30 deaths and $500 million in damage. The National Hurricane Center also maintains the official Tropical Cyclone Report for Tropical Storm Alberto. More information on flooding from Alberto is available at the National Climatic Data Center website. For an interactive map of Tropical Storm Alberto visit the NOAA Coastal Services Center. Opal was first detected as a tropical wave moving off the African coast on September 11. The waved moved westward through the Atlantic and Caribbean and merged with a broad low pressure area over the western Caribbean on September 23. The combined system then developed into a tropical depression near the east coast of the Yucatan Peninsula on September 27. The depression drifted slowly northward, becoming Tropical Storm Opal as it reached the north coast of Yucatan on the 30th. Opal then moved slowly westward into the Bay of Campeche, where it became a hurricane on October 2. A gradual north-northeastward turn started later on the 2nd, with acceleration on the 3rd and 4th. Opal continued to strengthen, and a period of rapid strengthening late of the 3rd and early on the 4th made it a Category 4 hurricane. Weakening followed, and Opal was a Category 3 hurricane when it made landfall near Pensacola Beach, Florida late on the 4th. Opal continued quickly north-northeastward and became extratropical over the Ohio Valley on the 5th. The cyclone was last seen over the eastern Great Lakes on October 6. Hurlbert Field, Florida reported sustained winds of 84 mph with a peak gust of 144 mph, and gusts to 70 mph occurred as far inland as northwest Georgia. However, the main impact from Opal was from storm surge. A combination of storm surge and breaking waves inundated portions of the western Florida Panhandle coast to a depth of 10 to 20 ft. The surge was responsible for the bulk of the $3 billion in damage attributed to Opal in the United States. Opal was responsible for 9 deaths in the United States, including 8 from falling trees and one from a tornado. Opal was responsible for 50 deaths in Mexico and Guatemala due to flooding caused by heavy rains. The National Hurricane Center also maintains the official Tropical Cyclone Report for Hurricane Opal (PDF). For an interactive map of Hurricane Opal visit the NOAA Coastal Services Center. This powerful hurricane began developing over the southwestern Caribbean Sea on 22 October. It drifted westward and became a tropical storm later that day, then turned northward and became a hurricane by the 24th. Mitch then turned westward again and rapidly strengthened, becoming a Category 5 hurricane with a central pressure of 905 mb on the 26th. After passing over Swan Island on the 27th, a weakening Mitch moved slowly southward near the coastal Islands of Honduras. It made landfall over northern Honduras on the 29th as a Category 1 hurricane. Mitch gradually turned westward after landfall, and the surface center dissipated neat the Guatemala-Honduras border on 1 November. The remnant circulation aloft reached the Bay of Campeche on 2 November and began developing again. The re-born Mitch became a tropical storm on 3 November, then moved northeastward across the Yucatan Peninsula on the 4th. Mitch crossed south Florida as a tropical storm on the 5th and then became extratropical later that day. The extratropical cyclone remained strong as it crossed the Atlantic, eventually affecting the British Isles and Iceland on the 9th and 10th. Mitch ravaged the offshore islands of Honduras with high winds, seas, and storm surge. However the greatest impact was widespread heavy rains and severe floods in Honduras, Nicaragua, Guatemala, and El Salvador. Mitch caused an estimated 9,000 deaths in Central America with another 9,000 missing. Thirty-one people died when the schooner Fantome sank as it encountered the high winds and seas associated with the hurricane. Two people died in the Florida Keys when a fishing boat capsized. Mitch caused tremendous property, infrastructure, and crop damage in Central America, and an additional $40 million in damage in Florida. The National Hurricane Center also maintains the official Tropical Cyclone Report for Hurricane Mitch (PDF). 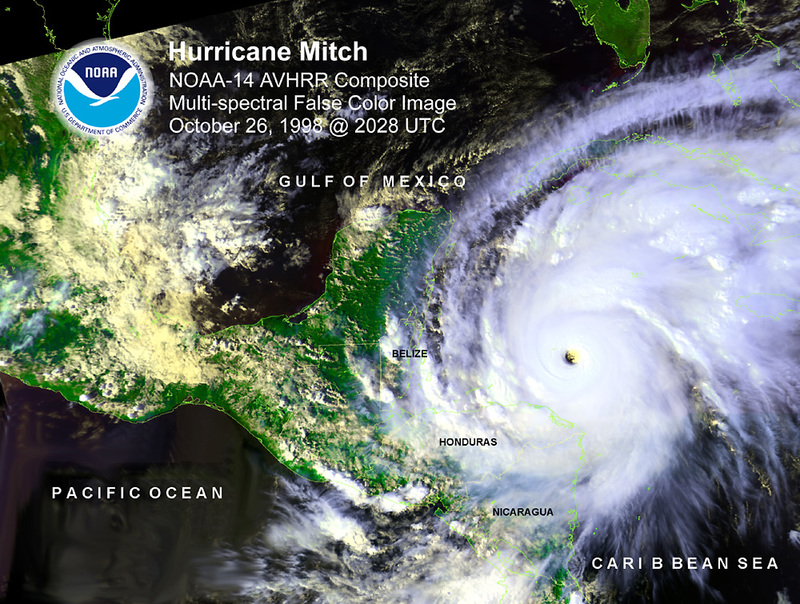 For an interactive map of Hurricane Mitch visit the NOAA Coastal Services Center. Floyd was first detected as a tropical wave that moved off the African coast on September 2. The system developed into a tropical depression over the tropical Atlantic on September 7. Moving steadily west-northwestward, the system became a tropical storm the next day and a hurricane on the 10th. A northwestward turn late on the 10th was followed by a westward turn on the 12th, with the second turn marking the time Floyd started strengthening in earnest. It became a Category 4 hurricane on September 13 as it approached the central Bahama Islands. A west-northwestward turn late on the 13th took the center through the northeastern Bahamas. This was followed by a gradual turn to the north-northeast, which brought the center to the North Carolina coast near Cape Fear on September 16 as a Category 2 hurricane. Floyd continued north-northeastward along the coast of the Mid-Atlantic into New England, where the storm became extratropical on the 17th. The remnants of Floyd merged with a large non-tropical low on September 19. 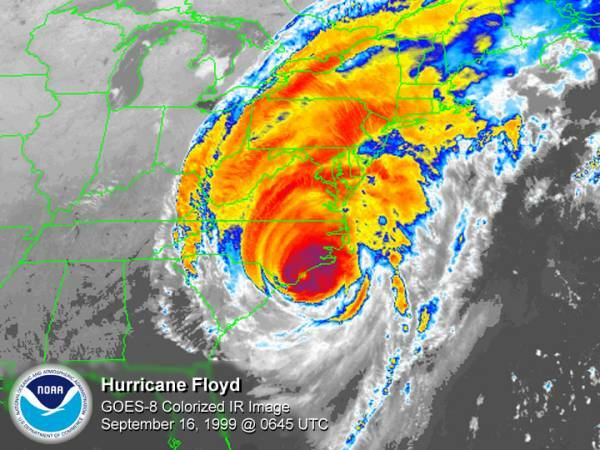 While wind gusts of 120 mph and storm surges of 9 to 10 ft were reported from the North Carolina coast, Floyd will be most remembered in the United States for its rainfall. The combination of Floyd and a frontal system over the eastern United States produced widespread rainfalls in excess of 10 inches from North Carolina northeastward, with amounts as high as 19.06 inches in Wilmington, North Carolina and 13.70 inches at Brewster, New York. These rains, aided by rains from Tropical Storm Dennis two weeks earlier, caused widespread severe flooding that caused the majority of the $3 to 6 billion in damage caused by Floyd. These floods also were responsible for 50 of the 56 deaths caused by Floyd in the United States. Floyd also caused damage in the Bahamas, with one death reported. The National Hurricane Center also maintains the official Tropical Cyclone Report for Hurricane Floyd (PDF). For an interactive map of Hurricane Floyd visit the NOAA Coastal Services Center. Information on rainfall and flooding from Floyd is available from the NOAA National Climatic Data Center. More images of Floyd are available from NASA Goddard Laboratory website. Keith began developing on 28 September when a tropical depression formed over the northwestern Caribbean Sea. The cyclone moved slowly northwestward on the 29th as it became a tropical storm, then it rapidly intensified into a Category 4 hurricane on the 30th while drifting westward toward the coast of Belize. 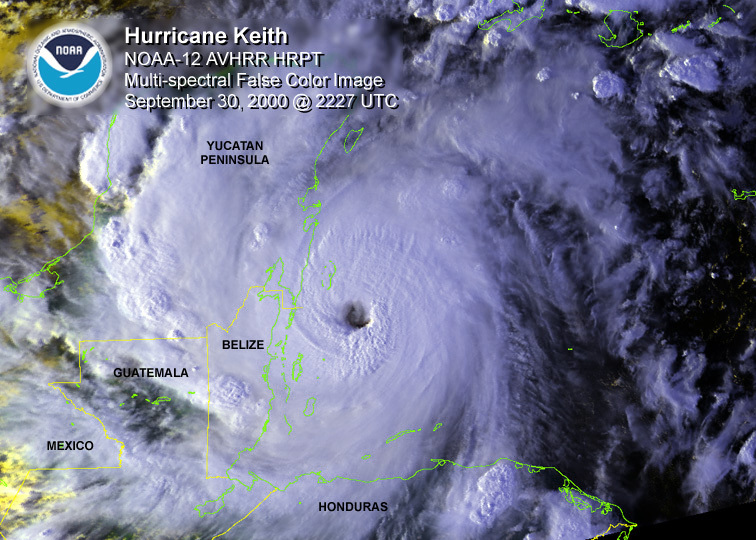 Keith stalled with the eyewall over the offshore islands of Belize on 1 October, and it wasn't until the 3rd that the center made landfall in Belize. Keith weakened during this time and was a tropical storm at landfall. It moved west-northwestward over the Yucatan Peninsula and further weakened to a depression on the 4th. Keith emerged in the Bay of Campeche late that day and quickly regained tropical storm strength. It again became a hurricane on the 5th before making landfall just north of Tampico, Mexico as a Category 1 hurricane. The cyclone dissipated over northeastern Mexico the next day. Keith was responsible for 24 deaths - 12 in Nicaragua, 5 in Belize, 6 in Honduras, and 1 in Mexico. The deaths in Belize occurred when two catamarans broke loose during the storm, while 5 of the deaths in Honduras occurred when an airplane disappeared near Roatan Island. Damage to property, agriculture, and tourism in Belize was estimated at $225 million. The National Hurricane Center also maintains the official Tropical Cyclone Report for Hurricane Keith (PDF). For an interactive map of Hurricane Keith visit the NOAA Coastal Services Center. Allison's long and complex career began on 5 June as an area of disturbed weather over the northwestern Gulf of Mexico developed into a tropical storm. The storm made landfall near Freeport, Texas later that day. Allison weakened to a depression on the 6th, while drifting northward, then it made a slow loop over southeastern Texas from the 7th to the 9th. The cyclone moved into the Gulf of Mexico on the 10th and acquired subtropical characteristics. It then moved east-northeastward over southeastern Louisiana on the 11th, where it re-intensified into a subtropical storm. Allison weakened back to a subtropical depression on the 12th while continuing east-northeastward, and this motion carried it to southeastern North Carolina by the 14th where it again stalled. The cyclone drifted northward to northeastward drift over land on the 15th and 16th. This was followed by a faster northeastward motion on the 17th as the center emerged into the Atlantic. Allison regained subtropical storm strength later that day before becoming extratropical on the 18th southeast of Cape Cod. The system dissipated southeast of Nova Scotia the next day. Allison brought tropical-storm-force winds and above normal tides to portions of the Texas and Louisiana coasts. However, the greatest legacy of the cyclone was the widespread heavy rains and resulting floods along the entire path of the cyclone (figure). Houston, Texas, was the worst affected area, as the Port of Houston reported 36.99 inches and several other locations reported more than 30 inches (figure). The storm also spawned 23 tornadoes. Allison was responsible for 41 deaths and at least $5 billion in damage in the United States, making it the deadliest and costliest U. S. tropical storm of record. The National Hurricane Center also maintains the official Tropical Cyclone Report for Tropical Storm Allison (PDF). For an interactive map of Tropical Storm Allison visit the NOAA Coastal Services Center. Iris first became a tropical depression just east of the lesser Antilles on 4 October. The depression tracked west-northwestward into the eastern Caribbean where it became a tropical storm on the 5th and a hurricane on the 6th. Iris then turned westward, passing just south of Jamaica on the 7th. The storm then moved quickly west-southwestward toward the coast of Belize as it became a small but powerful Category 4 hurricane on the 8th (figure). 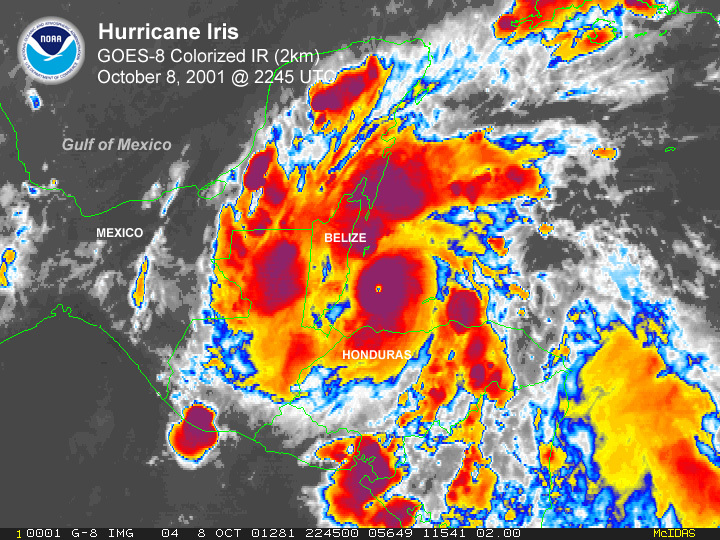 Iris made landfall over southern Belize early on the 9th at Category 4 intensity, then quickly weakened after landfall to dissipation later that day. The winds and storm surges of Iris caused severe damage over portions of the southern Belize coast. The storm was responsible for 31 deaths, including 20 in Belize, 8 in Guatemala, and 3 in the Dominican Republic. The deaths in Belize occurred when the M/V Wave Dancer capsized in port, killing 20 of the 28 people on board. The National Hurricane Center also maintains the official Tropical Cyclone Report for Hurricane Iris (PDF). For an interactive map of Hurricane Iris visit the NOAA Coastal Services Center. A well-organized but slow moving tropical wave that exited the African coastline on September 1st developed into Tropical Storm Isabel on the morning of September 6th. Isabel became a hurricane on September 7th and rapidly intensified to Category 4 hurricane strength on the evening of the 8th while the eye was located more than 1100 miles to the east of the Leeward Islands. This impressive hurricane reached Category 5 strength on September 11th, making Isabel the strongest hurricane in the Atlantic basin since Mitch in October 1998. The cyclone turned northwestward around the western periphery of the Atlantic ridge beginning on the 15th. Isabel began to weaken on the 15th as conditions aloft became more hostile, and it fell below major hurricane strength for the first time in eight days on the 16th. Although weakening, Isabel’s wind field continued to expand as hurricane warnings were issued for most of the North Carolina and Virginia coastline, including the Chesapeake Bay. Isabel’s large eye pushed ashore just after the noon hour on September 18th near Drum Inlet along North Carolina’s Outer Banks. Isabel was the worst hurricane to affect the Chesapeake Bay region since 1933. Storm surge values of more than 8 feet flooded rivers that flowed into the Bay across Virginia, Maryland, Delaware, and Washington, D.C. Isabel brought tropical storm force gusts as far north as New York State as it moved inland. The most intense hurricane of the 2003 season directly resulted in 17 deaths and more than 3 billion dollars* in damages. The large wind field toppled trees and cut power to more than four million customers. The National Hurricane Center also maintains the official Tropical Cyclone Report for Hurricane Isabel (PDF). For an interactive map of Hurricane Isabel visit the NOAA Coastal Services Center. Charley originated from a tropical wave, developing into a tropical depression on August 9 about 115 miles south-southeast of Barbados. The depression strengthened within a low-shear environment to a tropical storm early the next day in the eastern Caribbean, and became a hurricane on the 11th near Jamaica. Charley's center passed about 40 miles southwest of the southwest coast of Jamaica, and then passed about 15 miles northeast of Grand Cayman as the hurricane reached category 2 strength on the 12th. Charley turned to the north-northwest and continued to strengthen, making landfall in western Cuba as a category 3 hurricane with 120 m.p.h. maximum winds. Charley weakened just after its passage over western Cuba; its maximum winds decreased to about 110 m.p.h. by the time the center reached the Dry Tortugas around 8 am on the 13th. Charley then came under the influence of an unseasonably strong mid-tropospheric trough that had dropped from the east-central United States into the eastern Gulf of Mexico. The hurricane turned north-northeastward and accelerated toward the southwest coast of Florida as it began to intensify rapidly; dropsonde measurements indicate that Charley's central pressure fell from 964 mb to 941 mb in 4.5 hours. By 10 am, the maximum winds had increased to near 125 m.p.h., and three hours later had increased to 145 m.p.h. - category 4 strength. Charley made landfall with maximum winds near 150 m.p.h. on the southwest coast of Florida just north of Captiva Island around 3:45 pm. An hour later, Charley's eye passed over Punta Gorda. The hurricane then crossed central Florida, passing near Kissimmee and Orlando. Charley was still of hurricane intensity around midnight when its center cleared the northeast coast of Florida near Daytona Beach. After moving into the Atlantic, Charley came ashore again near Cape Romain, South Carolina near midday on the 14th as a category 1 hurricane. The center then moved just offshore before making a final landfall at North Myrtle Beach. Charley soon weakened to a tropical storm over southeastern North Carolina and became extratropical on the 15th as it moved back over water near Virginia Beach. Although ferocious, Charley was a very small hurricane at its Florida landfall, with its maximum winds and storm surge located only about 6-7 miles from the center. This helped minimize the extent and amplitude of the storm surge, which likely did not exceed 7 feet. However, the hurricane's violent winds devastated Punta Gorda and neighboring Port Charlotte. Rainfall amounts were generally modest, less than 8 inches. Charley also produced 16 tornadoes in Florida, North Carolina and Virginia. The total U. S. damage is estimated to be near $15 billion, making Charley the second costliest hurricane in U.S. history. Casualties were remarkably low, given the strength of the hurricane and the destruction that resulted. Charley was directly responsible for ten deaths in the United States. There were also four deaths in Cuba and one in Jamaica. The National Hurricane Center also maintains the official Tropical Cyclone Report for Hurricane Charley. For an interactive map of Hurricane Charley visit the NOAA Coastal Services Center. 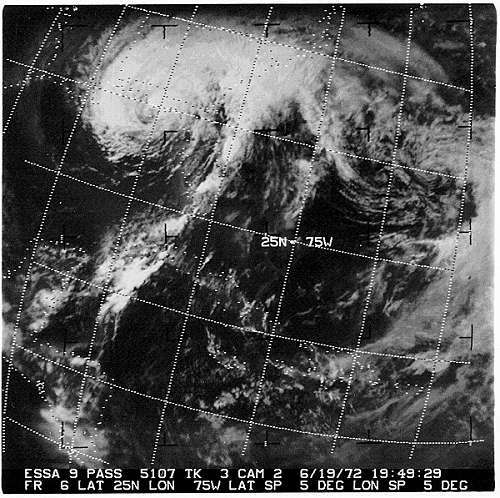 Frances developed from a tropical wave, becoming a tropical depression on August 25 several hundred miles west-southwest of the southern Cape Verde Islands, a tropical storm later that day, and a hurricane the following day. Frances moved generally west-northwestward for the next several days, passing north of the Leeward Islands on the 31st and just north of the Turks and Caicos Islands on the 2nd . During this time, Frances' peak winds reached 145 m.p.h. (category 4) on two occasions while the hurricane underwent a series of concentric eyewall cycles. Westerly wind shear then caused Frances to weaken to a category 2 hurricane by the time it passed over the northwestern Bahamas on the 4th . Frances made landfall near Stuart, Florida just after midnight on the 5th with 105 m.p.h. (category 2) maximum winds. Frances gradually weakened as it moved slowly across the Florida Peninsula, and became a tropical storm just before emerging into the northeastern Gulf of Mexico early on September 6. Frances made a final landfall in the Florida Big Bend region that afternoon as a tropical storm. Frances weakened over the southeastern United States and became extratropical over West Virginia on the 9th . Frances produced a storm surge of nearly 6 feet at its Florida east coast landfall, and caused widespread heavy rains and associated freshwater flooding over much of the eastern United States, with a maximum reported rainfall of 18.07 inches at Linville Falls, North Carolina. Frances was also associated with an outbreak of over 100 tornadoes throughout the southeastern and mid-Atlantic states. Eight deaths resulted from the forces of the storm - seven in the United States and one in the Bahamas. U.S. damage is estimated to be near $8.9 billion, over 90% of which occurred in Florida. The National Hurricane Center also maintains the official Tropical Cyclone Report for Hurricane Frances (PDF). For an interactive map of Hurricane Frances visit the NOAA Coastal Services Center. Ivan developed from a large tropical wave that crossed the west coast of Africa on August 31, and spawned a tropical depression two days later. The depression reached storm strength on September 3rd (one of only a dozen on record to do so south of 10EN) and continued to strengthen. By the 5th , Ivan had become a hurricane about 1150 miles east of the southern Windward Islands. Eighteen hours later Ivan became the southernmost storm to reach major hurricane status, at 10.2EN. Ivan was a category 3 hurricane when the center passed about 7 miles south of Grenada, a path that took the northern eyewall of Ivan directly over the island. In the Caribbean, Ivan became a category 5 hurricane, with winds of 160 m.p.h., on the 9th when it was south of the Dominican Republic, and on two occasions the minimum pressure fell to 910 mb. The center of Ivan passed within about 20 miles of Jamaica on the 11th and a similar distance from Grand Cayman on the 12th , with Grand Cayman likely experiencing sustained winds of category 4 strength. Ivan then turned to the northwest and passed through the Yucatan channel on the 14th , bringing hurricane conditions to extreme western Cuba. Ivan moved across the east-central Gulf of Mexico, making landfall as a major hurricane with sustained winds of near 120 m.p.h. on the 16th just west of Gulf Shores, Alabama. Ivan weakened as it moved inland, producing over 100 tornadoes and heavy rains across much of the southeastern United States, before merging with a frontal system over the Delmarva Peninsula on the 18th. While this would normally be the end of the story, the extratropical remnant low of Ivan split off from the frontal system and drifted southward in the western Atlantic for several days, crossed southern Florida, and re-entered the Gulf of Mexico on the 21st. The low re-acquired tropical characteristics, becoming a tropical storm for the second time on the 22nd in the central Gulf. Ivan weakened before it made its final landfall in southwestern Louisiana as a tropical depression on the 24th. Ivan's storm surge completely over-washed the island of Grand Cayman, where an estimated 95% of the buildings were damaged or destroyed. Surge heights of 10-15 feet occurred along the Gulf coast during Ivan's first U.S. landfall. Peak rainfall amounts in the Caribbean and United States were generally 10-15 inches. The death toll from Ivan stands at 92 - 39 in Grenada, 25 in the United States, 17 in Jamaica, 4 in Dominican Republic, 3 in Venezuela, 2 in the Cayman Islands, and 1 each in Tobago and Barbados. U.S. damage is estimated to be near $14.2 billion, the third largest total on record. The National Hurricane Center also maintains the official Tropical Cyclone Report for Hurricane Ivan (PDF). For an interactive map of Hurricane Ivan visit the NOAA Coastal Services Center. 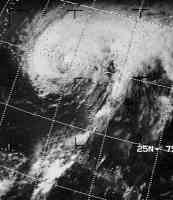 Jeanne formed from a tropical wave, becoming a tropical depression on September 13 near the Leeward Islands, and strengthening to a tropical storm the next day. Moving west-northwestward, Jeanne struck Puerto Rico on the 15th with 70 m.p.h. winds and then strengthened to a hurricane just before making landfall in the Dominican Republic. Jeanne spent nearly 36 hours over the rough terrain of Hispaniola, generating torrential rainfall before emerging into the Atlantic north of the island. Steering currents in the western Atlantic were weak, and Jeanne moved slowly through and north of the southeastern Bahamas over the next five days while it gradually regained the strength it had lost over Hispaniola. By the 23rd , high pressure had built in over the northeastern United States and western Atlantic, causing Jeanne to turn westward. Jeanne strengthened and became a major hurricane on the 25th while the center moved over Abaco and then Grand Bahama Island. Early on the 26th , the center of Jeanne's 60-mile-wide eye crossed the Florida coast near Stuart, at virtually the identical spot that Frances had come ashore three weeks earlier. Maximum winds at the time of landfall are estimated to be near 120 m.p.h. Jeanne weakened as it moved across central Florida, becoming a tropical storm during the afternoon of the 26th near Tampa, and then weakening to a depression a day later over central Georgia. The depression was still accompanied by heavy rain when it moved over the Carolinas, Virginia, and the Delmarva Peninsula on the 28th and 29th before becoming extratropical. Jeanne produced extreme rain accumulations in Puerto Rico and Hispaniola, with nearly 24 inches reported in Vieques. Rains from the cyclone resulted in historic floods in Puerto Rico, and deadly flash-floods and mudslides in Haiti, where over 3000 people lost their lives and roughly 200,000 were left homeless. Three deaths occurred in Florida, and one each in Puerto Rico, South Carolina, and Virginia. In the United States, damage is estimated to be near $6.9 billion. The National Hurricane Center also maintains the official Tropical Cyclone Report for Hurricane Jeanne (PDF). For an interactive map of Hurricane Jeanne visit the NOAA Coastal Services Center. Dennis formed from a tropical wave that moved westward across the coast of Africa on June 29. A tropical depression developed from the wave on July 4 near the southern Windward Islands. The cyclone moved west-northwestward across the eastern and central Caribbean sea, became a tropical storm on July 5, and strengthened into a hurricane early on July 6 about 245 miles east-southeast of Jamaica. Dennis intensified over the next two days, becoming a major hurricane on July 7 and a Category 4 hurricane with winds of 150 mph the next day just south of central Cuba. Dennis passed over Cabo Cruz, Cuba early on July 8 with winds of 135 mph, and then made landfall along the south-central coast of Cuba that afternoon near Cienfuegos with winds of 145 mph. After landfall, Dennis passed near Havana and weakened to a Category 1 hurricane before emerging over the southeastern Gulf of Mexico early on July 9. Although Dennis re-intensified into a Category 4 hurricane with winds of 145 mph early on July 10 over the eastern Gulf of Mexico, it weakened to Category 3 strength before making landfall over the western Florida Panhandle near Navarre Beach late that day. Dennis degenerated to a low pressure area over the Tennessee and Ohio Valleys, and it was eventually absorbed by an extratropical low over southeastern Canada on July 18. Dennis brought hurricane conditions to many portions of Cuba. Cabo Cruz reported sustained winds of 133 mph with a gust to 148 mph at 0200 UTC July 8, with a minimum pressure of 956 mb at 0240 UTC just before the eye passed over the station. The anemometer was destroyed, and it is possible more extreme winds occurred. Dennis also caused hurricane conditions in the western Florida Panhandle. An instrumented tower run by the Florida Coastal Monitoring Program (FCMP) at Navarre measured 1-min average winds (5-m elevation) of 99 mph and a gust to 121 mph at 1921 UTC July 10. Storm-total rainfalls in excess of 23 inches occurred on both Cuba and Jamaica. Heavy rainfall also occurred over much of Florida and extended well inland over portions of the southeastern United States with the maximum amount of 12.80 inches near Camden, Alabama. Ten tornadoes were reported in association with Dennis in the United States. Dennis caused 42 deaths - 22 in Haiti, 16 in Cuba, 3 in the United States, and 1 in Jamaica. The hurricane caused considerable damage across central and eastern Cuba as well as the western Florida Panhandle, including widespread utility and communications outages. Considerable storm surge-related damage also occurred near St. Marks, Florida, well to the east of the landfall location. The damage associated with Dennis in the United States is estimated at $2.23 billion. Damage in Jamaica is estimated at 1.9 billion Jamaican dollars* (approximately $31.7 million U. S.). The National Hurricane Center also maintains the official Tropical Cyclone Report for Hurricane Dennis (PDF). For an interactive map of Hurricane Dennis visit the NOAA Coastal Services Center. Katrina was one of the most devastating hurricanes in the history of the United States. It is the deadliest hurricane to strike the United States since the Palm Beach-Lake Okeechobee hurricane of September 1928. It produced catastrophic damage - estimated at $75 billion in the New Orleans area and along the Mississippi coast - and is the costliest U. S. hurricane on record. This horrific tropical cyclone formed from the combination of a tropical wave, an upper-level trough, and the mid-level remnants of Tropical Depression Ten. A tropical depression formed on August 23 about 200 miles southeast of Nassau in the Bahamas. Moving northwestward, it became Tropical Storm Katrina during the following day about 75 miles east-southeast of Nassau. The storm moved through the northwestern Bahamas on August 24-25, and then turned westward toward southern Florida. 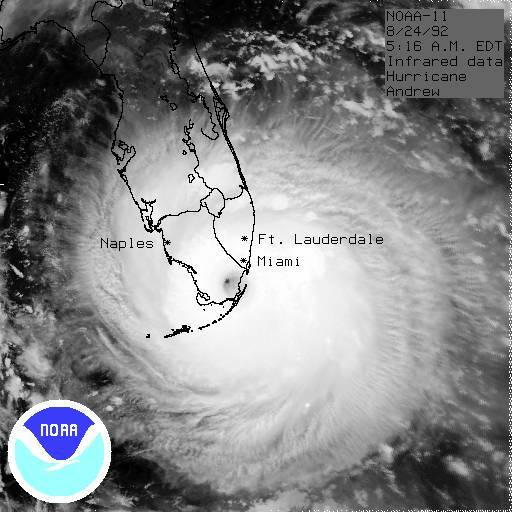 Katrina became a hurricane just before making landfall near the Miami-Dade/Broward county line during the evening of August 25. The hurricane moved southwestward across southern Florida into the eastern Gulf of Mexico on August 26. Katrina then strengthened significantly, reaching Category 5 intensity on August 28. Later that day, maximum sustained winds reached 175 mph with an aircraft-measured central pressure of 902 mb while centered about 195 miles southeast of the mouth of the Mississippi River. Katrina turned to the northwest and then north, with the center making landfall near Buras, Louisiana at 1110 UTC August 29 with maximum winds estimated at 125 mph (Category 3). Continuing northward, the hurricane made a second landfall near the Louisiana/Mississippi border at 1445 UTC with maximum winds estimated at 120 mph (Category 3). Weakening occurred as Katrina moved north-northeastward over land, but it was still a hurricane near Laurel, Mississippi. The cyclone weakened to a tropical depression over the Tennessee Valley on 30 August. Katrina became an extratropical low on August 31 and was absorbed by a frontal zone later that day over the eastern Great Lakes. Katrina brought hurricane conditions to southeastern Louisiana, southern Mississippi, and southwestern Alabama. The Coastal Marine Automated Network (C-MAN) station at Grand Isle, Louisiana reported 10-minute average winds of 87 mph at 0820 UTC August 29 with a gust to 114 mph. Higher winds likely occurred there and elsewhere, as many stations were destroyed, lost power, or lost communications during the storm. Storm surge flooding of 25 to 28 feet above normal tide level occurred along portions of the Mississippi coast, with storm surge flooding of 10 to 20 feet above normal tide levels along the southeastern Louisiana coast. Hurricane conditions also occurred over southern Florida and the Dry Tortugas. The National Hurricane Center reported sustained winds of 69 mph at 0115 UTC August 26 with a gust to 87 mph. Additionally, tropical storm conditions occurred along the northern Gulf coast as far east as the coast of the western Florida Panhandle, as well as in the Florida Keys. Katrina caused 10 to 14 inches of rain over southern Florida, and 8 to 12 inches of rain along its track inland from the northern Gulf coast. Thirty-three tornadoes were reported from the storm. Katrina is responsible for approximately 1200 reported deaths, including about 1000 in Louisiana and 200 in Mississippi. Seven additional deaths occurred in southern Florida. Katrina caused catastrophic damage in southeastern Louisiana and southern Mississippi. Storm surge along the Mississippi coast caused total destruction of many structures, with the surge damage extending several miles inland. Similar damage occurred in portions of southeastern Louisiana southeast of New Orleans. The surge overtopped and breached levees in the New Orleans metropolitan area, resulting in the inundation of much of the city and its eastern suburbs. Wind damage from Katrina extended well inland into northern Mississippi and Alabama. The hurricane also caused wind and water damage in Miami-Dade and Broward counties. The National Hurricane Center also maintains the official Tropical Cyclone Report for Hurricane Katrina (PDF). For an interactive map of Hurricane Katrina visit the NOAA Coastal Services Center. Rita, the third Category 5 hurricane of the season, was a destructive and deadly hurricane that devastated portions of southeastern Texas and southwestern Louisiana and significantly impacted the Florida Keys. A tropical wave and the remnants of an old front combined to produce and area of disturbed weather on 16 September. This system became a depression just east of the Turks and Caicos Islands late on 17 September, which moved westward and became a tropical storm the following afternoon. Maximum winds increased to 70 mph as Rita moved through the central Bahamas on September 19. While the storm did not strengthen during the following night, rapid intensification began on September 20 as it moved through the Straits of Florida. Rita became a hurricane that day and reached Category 2 intensity as the center passed about 50 miles south of Key West, Florida. After entering the Gulf of Mexico, Rita intensified from Category 2 to Category 5 in about 24 hours. The maximum sustained winds reached 165 mph late on September 21, and the hurricane reached a peak intensity of 180 mph early on September 22. Weakening began later that day and continued until landfall around 0740 UTC 24 September just east of the Texas/Louisiana border between Sabine Pass and Johnson's Bayou. At that time, maximum sustained winds were 115 mph (Category 3). Weakening continued after landfall, but Rita remained a tropical storm until reaching northwestern Louisiana late on 24 September. The cyclone then turned northeastward and merged with a frontal system two days later. Rita brought hurricane conditions to southwestern Louisiana and southeastern Texas. A FCMP instrumented tower at Port Arthur reported 1-min average winds of 94 mph at 0826 UTC September 24 along with a gust of 116 mph. The C-MAN station at Sea Rim State Park, Texas reported 2-minute average winds of 82 mph at 0700 UTC September 24, along with a peak gust of 99 mph. The hurricane caused storm-surge flooding of 10 to 15 ft above normal tide levels along the southwestern coast of Louisiana, caused a notable surge on the inland Lake Livingston, Texas, and inundated portions of the New Orleans area previously flooded by Katrina. Tropical storm conditions occurred in the Florida Keys, where the C-MAN station at Sand Key reported 10-minute average winds of 72 mph at 2110 UTC September 20 with a gust to 92 mph. The station failed shortly thereafter. Storm surge flooding of up to 5 feet above normal tide levels occurred in the Keys. Rita produced rainfalls of 5 to 9 inches over large portions of Louisiana, Mississippi, and eastern Texas, with isolated amounts of 10 to 15 inches. The cyclone spawned an estimated 90 tornadoes over the southern United States. Devastating storm surge flooding and wind damage in occurred southwestern Louisiana and extreme southeastern Texas, with some surge damage occurring in the Florida Keys. Rita was responsible for seven deaths, and it caused damage estimated at $10 billion in the United States. 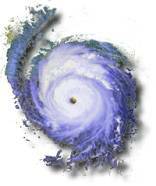 The National Hurricane Center also maintains the official Tropical Cyclone Report for Hurricane Rita (PDF). For an interactive map of Hurricane Rita visit the NOAA Coastal Services Center. The massive and powerful Wilma formed from a broad area of disturbed weather that stretched across much of the Caribbean Sea during the second week of October. A surface low pressure system gradually became defined near Jamaica on October 14, leading to the formation of a tropical depression on October 15 about 220 miles east-southeast of Grand Cayman. The cyclone moved erratically westward and southward for two days while slowly strengthening into a tropical storm. Wilma became a hurricane and began a west-northwestward motion on October 18. Later that day, Wilma began to explosively deepen. The aircraft-measured minimum central pressure reached 882 mb near 0800 UTC October 19. This pressure was accompanied by a 2-4 mile wide eye. Wilma's maximum intensity is estimated to have been 185 mph a few hours after the 882 mb pressure. On October 20, Wilma weakened slightly and turned northwestward toward the northeastern Yucatan Peninsula. Late on October 21, the slow-moving hurricane made landfall over Cozumel, followed by landfall early the next day over the northeastern Yucatan Peninsula - both at Category 4 intensity. Wilma moved slowly and weakened over northeastern Yucatan, emerging over the Gulf of Mexico early on October 23 as a Category 2 hurricane. Later that day it accelerated northeastward toward southern Florida. The hurricane strengthened over the Gulf waters, and its center made landfall near Cape Romano around 1030 UTC October 24 as a Category 3 hurricane. The eye crossed the Florida Peninsula in less than five hours, moving into the Atlantic just north of Palm Beach as a Category 2 hurricane. Wilma briefly re-intensified just east of Florida, then weakened thereafter. The hurricane moved rapidly northeastward over the western Atlantic and became extratropical about 230 miles southeast of Halifax, Nova Scotia late on October 25. The remnants of Wilma were absorbed by another low late the next day. Wilma brought hurricane conditions to the northeastern Yucatan Peninsula and the adjacent islands, as well as to southern Florida. In Mexico, Cancun reported 10-minute average winds of 100 mph with a gust to 130 mph at 0000 UTC October 22, while Cozumel reported a pressure of 928.0 mb late on October 21. The Isla Mujeres reported 62.05 inches of rain during the hurricane's passage. In Florida, a South Florida Water Management District (SFWMD) station in Lake Okeechobee reported 15-minute average winds of 92 mph with a gust to 112 mph at 1500 UTC October 24, while a nearby SFWMD station in Belle Glade reported a gust to 117 mph. Ten tornadoes occurred in Florida due to Wilma. Twenty-two deaths have been directly attributed to Wilma: 12 in Haiti, 1 in Jamaica, 4 in Mexico, and 5 in Florida. The hurricane caused severe damage in northeastern Yucatan, including Cancun and Cozumel, and widespread damage estimated at $16.8 billion in southern Florida. Wilma also produced major floods in western Cuba. The 882 mb pressure reported in Wilma is the lowest central pressure on record in an Atlantic hurricane, breaking the old record of 888 mb set by Hurricane Gilbert in September 1988. The central pressure fell 88 mb in 12 hours, which shatters the record of 48 mb in 12 hours held by Hurricane Allen in August 1980. The National Hurricane Center also maintains the official Tropical Cyclone Report for Hurricane Wilma (PDF). For an interactive map of Hurricane Wilma visit the NOAA Coastal Services Center. Ike was a long-lived and major Cape Verde hurricane that caused extensive damage and many deaths across portions of the Caribbean and along the coasts of Texas and Louisiana. It originated from a well-defined tropical wave that moved off the west coast of Africa on August 28 and then became a tropical depression on September 1 about 775 miles west of the Cape Verde Islands. The depression quickly strengthened to a tropical storm later that day. Ike became a hurricane on September 3, and Ike reached an estimated peak intensity of 145 mph (Category 4) on September 4 when it was located 550 miles northeast of the Leeward Islands. After weakening briefly, Ike regained Category 4 status just before moving across the Turks and Caicos Islands on September 7. Ike then passed over Great Inagua Island in the southeastern Bahamas at Category 3 strength. Ike turned westward and made landfall along the northeast coast of Cuba in the province of Holguin early on September 8 with maximum sustained winds estimated near 135 mph (Category 4). Ike made a second landfall in Cuba over the extreme southeastern part of the province of Pinar del Rio on September 9, with winds of 80 mph (Category 1). It moved into the southeastern Gulf of Mexico later that day. Ike developed a large wind field as it moved northwestward across the Gulf of Mexico over the next 3 days, with tropical-storm-force winds extending up to 275 miles from the center and hurricane-force winds extending up to 115 miles from the center. The hurricane gradually intensified as it moved across the Gulf toward the Texas coast. 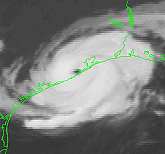 Ike made landfall over the north end of Galveston Island in the early morning hours of September 13 as a Category 2 hurricane with maximum sustained winds of 110 mph. The hurricane weakened as it moved inland across eastern Texas and Arkansas and became extratropical over the middle Mississippi Valley on September 14. It then moved rapidly through the Ohio valley and into Canada, producing wind gusts to hurricane force along the way. Grand Turk Island reported sustained winds of 116 mph as the center of Ike crossed the island. Storm surges of 15-20 feet above normal tide levels occurred along the Bolivar Peninsula of Texas and in much of the Galveston Bay area, with surges of up to 10 feet above normal occurring as far east as south central Louisiana. Storm total rainfalls from Ike were as much as 19 inches in southeastern Texas and 14 inches in Cuba. Ike left a long trail of death and destruction. It is estimated that flooding and mud slides killed 74 people in Haiti and 2 in the Dominican Republic, compounding the problems caused by Fay, Gustav, and Hanna. The Turks and Caicos Islands and the southeastern Bahamas sustained widespread damage to property. Seven deaths were reported in Cuba. Ike's storm surge devastated the Bolivar Peninsula of Texas, and surge, winds, and flooding from heavy rains caused widespread damage in other portions of southeastern Texas, western Louisiana, and Arkansas. Twenty people were killed in these areas, with 34 others still missing. Property damage from Ike as a hurricane is estimated at $19.3 billion. Additionally, as an extratropical system over the Ohio valley, Ike was directly or indirectly responsible for 28 deaths and more than $1 billion in property damage. The National Hurricane Center also maintains the official Tropical Cyclone Report for Hurricane Ike (PDF). For an interactive map of Hurricane Ike visit the NOAA Coastal Services Center. * Dollar amounts in the year that the hurricane occurred. The periodical Monthly Weather Review - articles used included annual hurricane season summaries published by the National Hurricane Center, along with season summaries and individual storm articles written in the years before the National Hurricane Center was created.